Daily Trust incurred the wrath of the military with its lead report on Sunday with the bold caption: “Military prepares massive operation to retake Baga, others”. 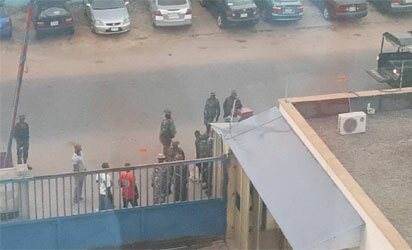 Shortly after the paper hit the streets on Sunday, heavily armed soldiers in several vehicles laid siege to Daily Trust headquarters in Abuja. The soldiers also surrounded the premises, dismissed the Mobile Police guards, barring everyone from entering or leaving the premises. Another set of angry soldiers had earlier in the day taken over the paper’s office in Maiduguri and arrested two reporters, including the Bureau Chief, Usman Abubakar. In its Sunday Lead report entitled “Military prepares massive operation to retake Baga, others”, Daily Trust highlighted how the military planned to retake those towns, which it claimed, were under ISWAP control, with massive deployment of troops and equipment, an expose, which apparently angered the military high command. According to eyewitnesses, the soldiers forced the gate open at the head office and drove in with three Jokic vans loaded with armed soldiers, who ordered everyone in the building to move to the ground floor while they removed all available computers. All efforts to get the Military authorities’ response to the invasion proved abortive as at the time of filing the report. However, the The Editor in Chief of Daily Trust, Mannir Dan Ali, told an online medium Sunday night that the face-off with the soldiers was being resolved. Dan Ali said the military was merely using the paper’s current edition as an excuse to clampdown on the newspaper, but that it was clear authorities were unhappy with Daily Trust’s coverage of the recent losses to Boko Haram. He said, “Government officials are trying to resolve the matter”. A military source said the army was incensed by the disclosure by the newspaper of the surprise strategy which the military was planning to unleash on the insurgents thereby ‘leaking’ information to the enemies.